Usually, this is the time of the year when many of us make resolutions. The question is not if we have resolutions, the ‘answer’ is if we use the right words. Recently in a radio interview Enigmatic Olumide talked about the prowess of Poets as the experts people should consult for the right use of words, and we will bring that idea into #bb9. Let’s rain words. Let’s make resolutions. But most importantly, let’s learn to place priority on words and use them rightly! Join us as we open the New Year with the rain of words centering on changes in our lives, our creative industry, and our nation, Nigeria. 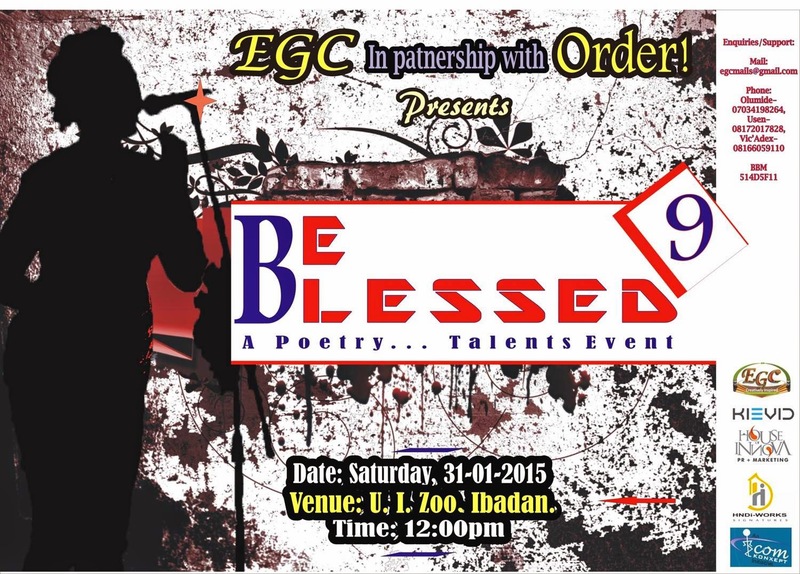 Join us for Be Blessed (a quarterly Poetry and sundry Talent event). Like the past editions, you will hear/see spoken words/performance poetry from our regular performers (whom we now call one another families), with an infusion of new talents who will be given time to perform during the Open Mic sessions. Be Blessed 9 (aka #bb9) is brought to you by EGC media in conjunction with Order, and with the support of House of innova, KIEVD, HNDi Signatures, Ogbeni Femi, I-com Konxepts, Bishop & Knights, WRR, & Breadplus.